The accountability court on Friday announced the verdict in the Avenfield properties corruption reference filed by the National Accountability Bureau (NAB), handing ousted prime minister Nawaz Sharif 10 years as jail time for owning assets beyond known income and 1 year for not cooperating with NAB. The sentences will run concurrently which means the former prime minister will serve 10 years in jail. His daughter Maryam was given 7 years for abetment after she was found "instrumental in concealment of the properties of her father" and 1 year for non-cooperation with the bureau. These sentences will also run concurrently; she will serve 7 years in total. According to the verdict, she "aided, assisted, abetted, attempted and acted in conspiracy with her father". "The trust deeds produced by the accused Maryam Nawaz were also found bogus," read the judgement. Nawaz's son-in-law retired Captain Safdar has been given 1 year jail time — for not cooperating with NAB, and aiding and abeting Nawaz and Maryam. The non-cooperation punishment for all three has been given under Serial 2 of the schedule of the National Accountability Ordinance (NAO) 1999: "Refuses to answer questions, or to provide information to any member of the NAB or any other agency when required to do so." 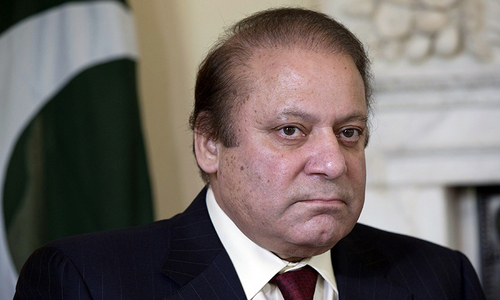 Nawaz was convicted under NAO 1999 9(a)(v): "A holder of a public office, or any other person, is said to commit or to have committed the offence of corruption and corrupt practices [...] if he or any of his dependents or benamidar owns, possesses, or has acquired right or title in any assets or holds irrevocable power of attorney in respect of any assets or pecuniary resources disproportionate to his known sources of income, which he cannot reasonably account for or maintains a standard of living beyond that which is commensurate with his sources of income." The abetment conviction for Maryam and Safdar falls under NAO 1999 9(a)(v)(xii), which states: "Is said to commit or to have committed the offence of corruption and corrupt practices [...] if he aids, assists, abets, attempts or acts in conspiracy with a person or a holder of public office accused of an offence." As the 9-month-long trial concluded, Nawaz was handed a fine of £8 million and Maryam £2 million. The money will go into the state treasury. 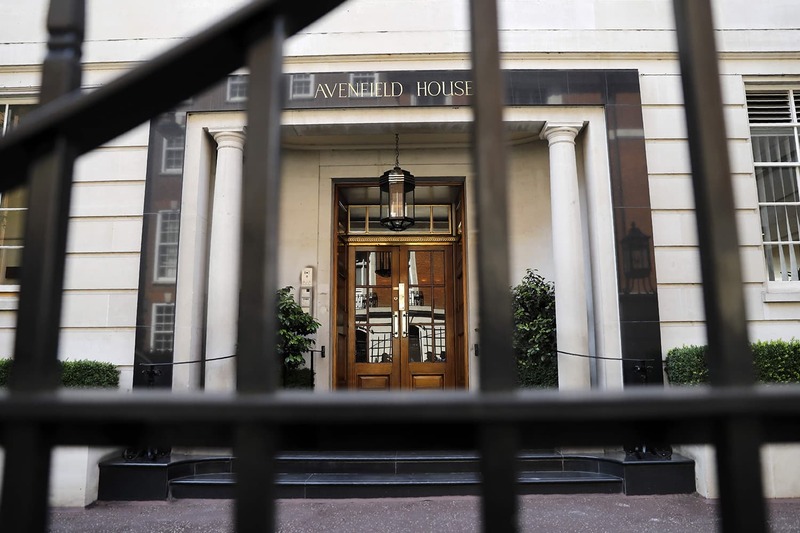 According to AFP, prosecution lawyer Sardar Muzaffar Abbas said that the court had ordered the properties, in London's exclusive Mayfair, be confiscated by the federal government. The sons, Hasan and Hussain Nawaz, also accused in the case, are "absconding therefore, they are declared as proclaimed offenders. Non bailable perpetual warrants of arrest shall be issued against them". Maryam and Capt Safdar can no longer contest the upcoming general elections. "The [...] accused shall be disqualified to contest election or to hold public office for a period of 10 years to be reckoned from the date he [sic] is released after serving the sentence," ruled the court. They, however, have the right to appeal against the verdict. NAB had filed the reference regarding the high-end properties in London, along with two others, on the Supreme Court's directives in the landmark Panamagate verdict last year which deseated Nawaz as the prime minister. Four members of the Sharif family ─ Nawaz, Maryam, Hassan and Hussain ─ are in London, while Captain Safdar is in Pakistan, but was not present in court. Soon after the verdict, Maryam took to Twitter to share this message: "This is a very small punishment for firmly standing in front of unseen forces. The morale to fight against oppression has increased today." NAB will now wait for a certain time period for all three convicts to surrender. If they fail to do so, NAB will initiate the procedure to bring Maryam and Nawaz back, and arrest Safdar. 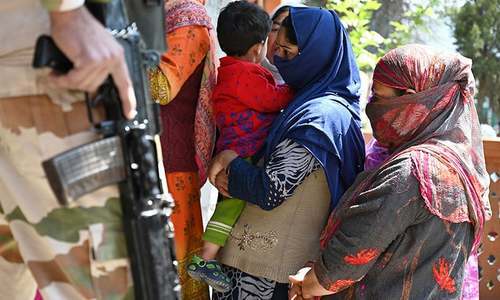 The counsel for the family had submitted an application to the accountability court on Thursday, seeking a seven-day postponement in the announcement of the verdict. The plea, however, was rejected in the morning. The atmosphere outside the court in Islamabad — where the fate of the Sharif family members was announced — was thick with tension and buzzing with media and security personnel. Both the capital police force and Rangers were deployed in riot gear outside the court. 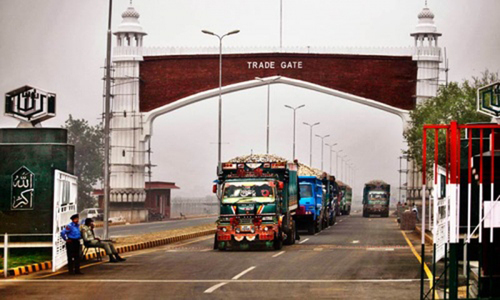 Moreover, Section 144 was imposed in the capital and police in the garrison city were on high alert. 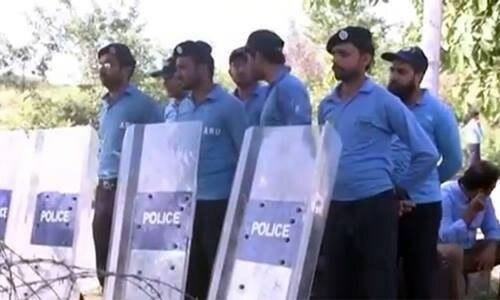 City Police Officer (CPO) Abbas Ahsan told Dawn earlier that although "strong retaliation" is not expected after the decision, they are taking precautionary measures to maintain peace in the city. 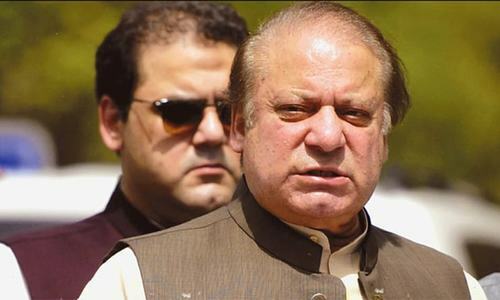 After Judge Bashir reached the accountability court on Friday morning, Additional Deputy Prosecutor General NAB Sardar Muzaffar Abbasi had opposed Nawaz and Maryam's application, saying: "At a stage when the court concludes the trial and fixes a date for the final announcement, the accused cannot file application for any relief." He pointed out that "when the court concludes the arguments, the accused is put on notice and under the law he should be brought to court, or the court orders the accused to ensure attendance." 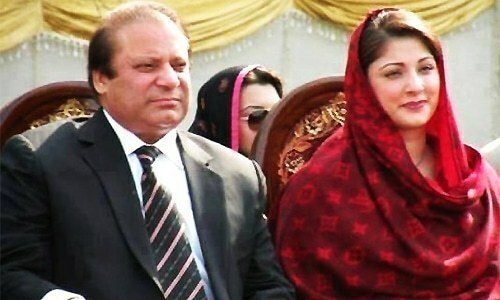 In a rebuttal, the defence counsel, Advocate Amjad Pervez, argued that "there is a legal requirement that the accused person should be summoned at the time of announcement of judgement, and in this case Sharif and his daughter Maryam Nawaz both are ready to attend proceedings, but because of Kulsoom Nawaz's illness, they requested that the judgement may be postponed for a few days." The judge, after an hour-long break, had ruled against the delay. 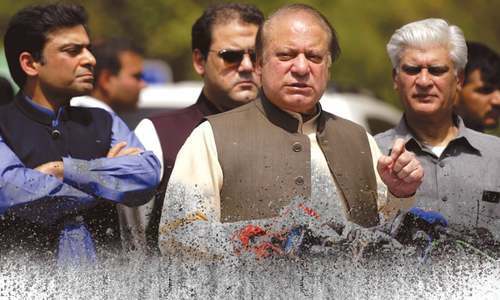 The Avenfield reference ─ which pertains to the purchase of four flats in Avenfield House, Park Lane, London ─ was among the three cases filed by the National Accountability Bureau (NAB) against the former premier and his children on the Supreme Court's orders in its landmark July 28 Panamagate verdict. The NAB prosecutor had stated before the accountability court that Nawaz Sharif had acquired the four flats. Sharif family had insisted that they had purchased the apartments through ‘legitimate’ financial resources. They, however, remained unable to disclose those resources before the accountability court or the Supreme Court. Read more: Iqama — the missing link with Panama? 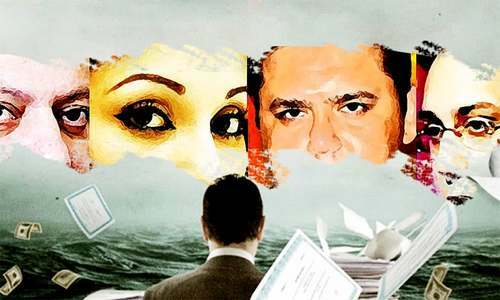 The proceeding in the Avenfield reference commenced in September and the accountability court indicted Nawaz, Maryam and Safdar on October 19. According to the JIT report submitted in the Panamagate case, the Sharifs have given contradictory statements about their London flats and found that the flats actually belonged to them since 1993. The JIT observed that either one or both brothers had lied to hide some facts and hence they could not be given the benefit of doubt. It said Nawaz Sharif had distanced himself from the apartments and could not explain the time frame and procedure adopted for obtaining the possession of Avenfield apartments by his sons, and was even uncertain about which son claimed the ownership of the flats now. But Nawaz told the JIT that he usually stayed in apartment No 16 (Avenfield) whenever he visited London. 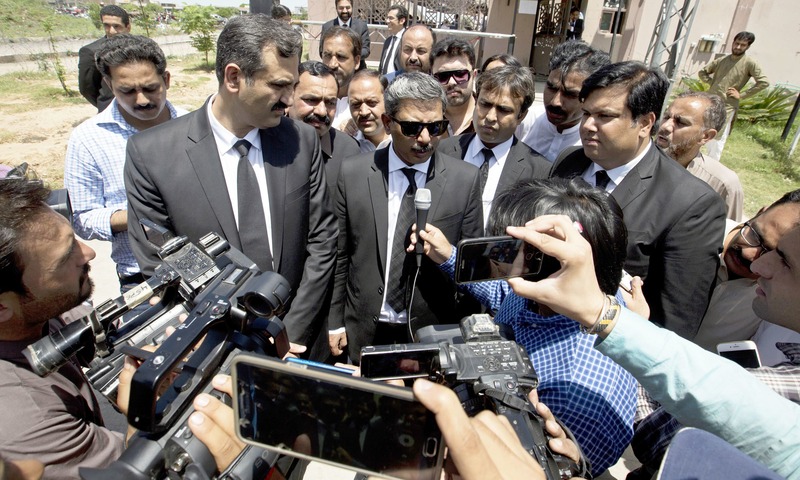 The prosecution produced 21 witnesses in the Avenfield reference, including star witness Wajid Zia, the head of the joint investigation team (JIT) which probed the Panamgate case, Director General NAB Zahir Shah, British forensic expert Robert William Radley and solicitor Akhtar Riaz Raja, who is Zia's cousin, among others. In May this year, Nawaz, his daughter and son-in-law recorded their statements under Section 342 of the Criminal Procedure Code (CrPC) after which the court invited final arguments from the prosecution and the defence counsel. However, he rejoined the legal team after Nawaz left for the United Kingdom in mid-June where his spouse Kulsoom Nawaz is undergoing medical treatment. During the course of arguments, the defence counsel cited a number of judgements of the superior courts to prove that the case against the former prime minister and his family was devoid of evidence. Nawaz and Maryam have appeared before the court around 100 times, according to media reports. Where there is smoke, there is fire. Justice should prevail irrespective of cast, creed and stature. Finally, the most awaited decision is going to be announced and justice shall previal! GoNawazGo but bring back all the wealth by selling the flats. No drama is required from any side at this stage of final judgment. I hope no injustice would be done. Delay no more. An accused of such heinous crime of looting public money should not be allowed to dictate terms. 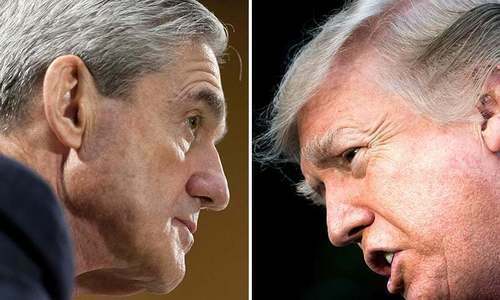 Millions have suffered ,and the nation is nearly bankrupt, all because of this corrupt individual,the longer he stays in jail better it will be. Simple question Kleptocracy and grand looting champion Nawaz, Maryam and family needed to answer, Where the money came from? All the time was giving to them but No answer! All they did is dodge, deceit and defame Judiciary and Pakistan. What a shameful end, all the money in the world but no respect from fellow Pakistanis anywhere in the world. No more family dynasty politics. With whatever written in this report, it is clear prosecution has failed to provide enough proofs to prosecute Sharifs. They may have done corruption but there is no proof. Prosecution is just alleging against all the Sharifs (five people) for four flats which show they also don’t know and failed in proving their case. Mr. Nawaz Sharif we believe you are innocent and we are with you. Wishing you a very good luck. It has been ‘too many’ absences of ‘few days’. Get on with it. I hope justice will prevail today and Nawaz Sharif and his children will get what they deserve, as they have looted tax payers money through corrupt practices! Simply, accused CANNOT dictate and tell judges to delay their verdicts, because they are not available - if this happens then certain individuals are bigger than law and let corrupt mafia rule the country! Right decision on dismissing the plea at this point in time. Please take back ill gotton money from them and construct some dams in our country! The most important issue that should be addressed is to get the looted money back home. Send these corrupt lot where they belong. The way things are unfolding, courts are making Nawaz a martyr. He will get sympathy votes. Nawaz and family needs be punished for ill that they did. Billions spend in making properties and starting businesses abroad all from loot of public money. NS plus his fellows and all other corrupt / gangsters must pay every penny they looted from Pakistan. Didn't he and his family members said that they do not have any property anywhere in the world. According to few reports he is seated in that apartment to hear the verdict. The criminal is at the crime scene to know his fate. What a coincidence. Max sentence will be 3 years which will come down to six months after forgiveness. why are they wasting time! The irony of this is that Nawaz will be sitting in his Avenfield apartment while listening to the verdict. Expose sharifs monopoly, this nation has already suffered a lot.... last 40 years whole world has changed and our beloved coutry is in ruins. Please no more delay, enough is enough. Does the Verdict helps to pull the looted money? Expect Civil War if Nawaz is punished. The day of reckoning for NS and family. The moment of truth! It is too late for them to redeem themselves, even if they fail to show up in court. Don't expect NS and Maryaam to return to Pakistan to face jail term, if the verdict goes against them. They are comfortably sitting in their luxury apts in London and can easily seek Political Asylum to make their stay permenant. Now we will all be left wondering, why did no one bother to add their names to the ECL while they were still in Pakistan!?? Thereby, another probe into corruption at FIA and Ministry of Interior to ensue?? I wonder if the Shariffs have sought political asylum in the U.K.? Punjab is with Nawaz sharif because of his dedicated work. the verdict is delayed twice today. is there some settlement being done. or is the judgment is being reviewed by someone in power corridors? something is fish. Country wants it’s money back, that’s all. Rid this country from corruption. Judgement now pushed to 3.30pm ....... looks like another Aakama judgement. Sounds like last minute changes and amendments to the verdit under way. Hence the delay in verdict. Someone is pulling the strings! Some thing cooking - may be decision on NS's political asylum in UK is also on the cards & his verdict may be announced after that just to give him safe exit. Jail this corrupt clan for life and bring back the looted wealth!!! @Sid - "I wonder if the Shariffs have sought political asylum in the U.K.?" They will stoop to any level to safeguard their loot. @Harris ... Injustice to the Sharifs or to the country? @Imtiaz Ali Khan ... Dynasties and democracy are incompatible. That is the very point of it all. Why we are waiting for the verdict it is written on the wall. Selective justice is dangerous for this country. @Ash2000 ... They can still go to jail for forgery, perjured testimony and contempt of court. All that has been proven. Next stop for Sharifs - if they return to Pakistan - Adiala Jail! Would you rather stay in your luxury Apt in London, or go to jail in Pakistan!? Does anyone really expect them to return to Pakistan with that prospect awaiting them?? Nawaz Sharif will be victorious even if decision is against him. In this delay, hopefully there shouldn’t be punishment for the nation. How unfortunate the situation is for Pakistani Nation that Nawaz and Family is listening the verdict in the flats for which they are accused of money laundering. will the looted money be backed to Pakistan. @abid History is repeating. Hope it doesn't harm Pakistan. So that means, that NS nor Maryaam are ever returning to Pakistan! Bingo! 10 years NS and 7 years MN - Bye Bye Corruption!!!!! sentence too lenient. 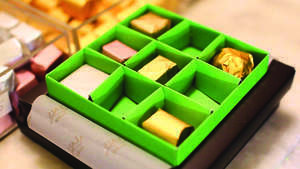 Need to be made an example. Well done Imran Khan for pushing and pushing! Next when IK comes to power to get the rest. Zardari NEXT. They should be judged for going against the oath PM took. They had made life miserable for 200 million Pakistanis for so many years. PPP should also be judged. Boycott all in the next elections and show them that Pakistanis can say NO TO CORRUPTION. Congratulations Pakistan. Bring back these thugs along with the looted wealth of Pakistan and its citizens and lock them in the prison. Historic day for PAK, Finally the Godfather reached the destination. It is not only a decision but a great precedent for corrupts and looter. This decision has made Shahbaz Shareef Pakistan's next prime minister. Well done you can run but you cant hide !!!! Justice has been served!!! What happens to the apartments? Are these taken over by the government of Pakistan, sold and funds brought to Pakistan? I do believe that Nawaz is corrupt but the sheer timing of the result made me suspicious about the justice process. Why they found only Nawaz and corruption. Is Nawaz only corrupt person in Pakistan. Why there is no day to day hearing for Mushraff high treason case always baffles me? You can run but u cannot hide now!!! Justice Prevailed! Long Live Pakistan!!!! Congratulations Pakistan. Jail term should be minimum 25 years. Justice is the only institution to purge out the deep rooted professional and political corruption in the country; and now, it doing its work with a balanced approach. @Alba Injustice to the both has been done. Thank you Imran Khan, for your sacrafice and courage. A precedence has been set today for accountability in pakistan. Great day for Pakistan. ZARDARI you are next!!! We do not know if they will come back and will actually be arrested. The court should start the process to get possession of the property whose source of funds is unexplained and use the proceeds to develop Pakistan in areas of education, water availability, security, electricity etc etc. Pre-planned coup to oust PML-N by all means and at all costs. Where is Musharaf ?. Why no action against him ? Today we all are vindicated... long live imran khan and kudos to our courts. Zardari and these fake bhutto’s should be next... Inshallah. Finally it was proved that Sharifs are no more sharif. @Iram This is very important. Bring back to looted money to Pakistan and use it for development of the country. Waiting for the day when big and more dirty fishes will pass through the same accountability process. Have more trials of other culprits. Justice started to prevail in my country. It will lead to the DAWN of prosper and developed Pakistan. Doubt NS, MNS will return or sent to jail. Passing the order is one thing and sending to jail is another. Excellent decision by the accountability court in Islamabad, Islamic Republic of Pakistan. Keep it up and hang on tough. If he serves 10 years in a Normal jail not VIP I am happy how ever the properties should have been confiscated whwn therr is no proof of funds. ! Judge seems very lenient with these criminals. They were supposed to sent to jail for a 1000 years. Not enough. All property should have been confiscated like it happens usually. Shahbaz Sharif must be quite happy. Imran Khan is the only person on the national scene who speaks the truth with courage. His victory will change the course of Pakistan in the upcoming election. Great day for Pakistan for sending Maryam Nazaw Sharif and her father to jail in Avenfield corruption reference. Finally justice for the people of Pakistan. But the question is how are you going to bring the two back to Pakistan to face the punishment? Poor Capt. Safdat, will be the only one to go to jail. Court should have ordered that if Nawaz and Maryam not return to Pakistan, all their properties, businesses and bank accounts in Pakistan should be confiscated, starting from their palace in Raiwind. Great day for Pakistanis. Finally, there is some hope for the future of Pakistan. What a turning point for our country. Excellent decision. I'm listening to Shahbaz Sharif interview and he is on and on about why other were not caught over the last 70 years...wow that's like Trump tactics. Overall law must prevail no matter what. @Ali Akbar "Passing the order is one thing and sending to jail is another." The sentence matters the most. If they're sent to jail without sentence, it would not count. A big victory of the people of Pakistan. Mashallah. Let it be a lesson for the future. Good job SC.. So are they going to return to Pakistan, or will they stay in the Safe Haven (London) for Corrupt Pakistani Politicians ? It is one of the historic and a great day for Pakistan and its justice system. The journey should not end here and other corrupt politicians including Zardari should be brought to justice. What about the wealth they looted from this country, how will that be returned or are they going to enjoy it in London. Let us hope this is first small step towards eliminating corruption throughout all circles colluding to deprive this country and its citizens at large of all kinds of material, ethical and constitutional resources whereby they could have achieved a good name through education, health, brain power and honest hard work. Fair verdict is announced. Now Nawaz, Maryam and Safdar should respect the decision of the court rather than doing lots of blabbering. Every one should learn to accept the decision of court, no matter who they are and what they do. It is good beginning for a fair rule in future. However, there are many other notorious figures which should be brought to the book as well. Sharif down. Zardari, Achakzai and Altaf Hussain next! Only £10 million for properties worth nearly a Billion £, that only a year Rental income for them, that's a JOKE, they will be free in few years with Billions in overseas banks and properties. Soon Mr Nawaz and his daughter will receive Presidential pardon. Long Live Mamnoon Hussain..RIP justice. @Tamza No concerns for Begum Kulsoom when they have to attend a political meeting, then why use her as an excuse when it comes to this scenario. It is biased decision of judiciary. Justice is not fullfiled here. Both father and daughter will request for political asylum in London. It seems that expect NS and his family all others in Pakistan are clean and honest. NAB must complete investigations against other politions bureaucrats and military officers with the same zeal and speed. Congratulations. Its the best day in the history of Pakistan, Good Job done. keep it up and hang on tough. Not a supporter of PMLN but this seems incredibly suspect on part of the judiciary - the hearings should be made public and a similar procedures should be applied to other notable corrupt politicians irrespective of the party they belong to. Looking forward to see Zardari, his sister and his kabza group along with mafia group behind bar. Next step. the timing of this verdict smacks of political engineering. a dark day for Pakistani democracy. Will Asif Zardari et al be the next to face the music and sent to prison too? I bet Zardari is already packing his bags. Ordered to pay back mere £8 million? This is peanuts!!! They just sold one of 21 'declared' properties for £46 million. Time to grab likes of Malik Riaz and Zardari. Whats the real story hear? 10 years for owning foriegn property? I'm no fan of the Sharif family but the numbers dont add up here. @Concerned Citizen "Soon Mr Nawaz and his daughter will receive Presidential pardon. " Maybe. That doesn't overturns the verdict though. Today the plot and the conspiracy is complete. The general who overthrow the govt has not been tried and living outside the country. The man who demanded his trial has been convicted and sentenceed for 10 years. Nawaz Sharif is a great leader. He is the tiger of Pakistan. No one can fight with him. If you send him in jail, then in Pakistan there will be a civil war condition. Punjab people love him. He is a great leader of Pakistan. Justice was done. Now it should be implemented. The most historic and sacred day in the history of Pakistan. A day when accountability began from the most powerful man in the country. Now, its time for others: Zardari, Altaf hussain, Ghulam bilour, Asfandyar wali, Achakzai, Fazlurrahman must not escape accountability and be punished severely as well. Well Done Pakistan. I am extremely happy!! A thieve of Rs 100 was always heard of conviction but not a mega CORRUPT politician in Pakistan. So a relief this time. Good RIDDANCE as the culprit of Avenfield APts is now locked there!!!! Too less punishment. He created root of laundering and ran this machine for around 30 years. He created people like zardari. And so maryam rightly said.. This is very small punishment. Unfortunately this will goto Appex courts in appeals.So seeing nawaz shareef in jail without qatari's,saudi's bailing them out ...will likely be few more years. Change is here! My question to NAB is that why other leaders are not in the list of the NAB like Zardari. Every one is corrupt why only Nawaz. This is Karma..... I believe this has happened because he maliciously started a stupid case against President Pervez Musharraf. I am not saying it is a direct result of it - but this is karma. @Vishnu karle Please be serious. He might have been a great asset for Indians but not for me as a Pakistani. As a Punjabi I hate him for his dishonesty and for being a security risk for my country. A civil war in Pakistan will only happen in your mind. @ivehadit "a dark day for Pakistani democracy." Bless the darkness, in that case!!! Pakistan will definitely become now popular Internationally as the country with the solid Judicial System. We stand by you, Mr. Sharif. Come back and take on the establishment. @Vijay B.. People like Nawaz Sharif and Zardari are always in for the last moment. Power and money is too attractive to be passed out on. Finally justice is served to these corrupt politicians who are leaching the country. Proud of you Pakistan. Nope, justice always start form the first. Justice Says that those who committed first will be punished first. There may be some exception where merit demands but i think high treason is more important than corruption. So ideally it should be Musharraf not Nawaz. His two sons must also be held to account. They can not get away from breaking the law by obtaining British passports. Interpol must be contacted. Western nations do this all the time, so should we! @Kamran these flats are just a fraction of their stolen wealth. They should be fined ten times more than 10M pounds. this is noting for them. Hats off to pak judiciary..hope to see same in India wrt some powerful and corrupt politicians. The justice has been served so now people should accept and concentrate on future of the country and elect the politicians who are loyal to the country not the looters. All is well that ends well. Now Country wants it’s wealth back. Decision Improves country’s image among comity of nations. We people of Pakistan have waited long to see these big fishes behind bars. Thank you SC for setting up this great precedent! @Indian perspective maybe the track in your country try, not ours. We are on way to massive progress and corruption free society. Pakistan today has turned the corner.and the era of the corrupt and looting is ending. Next elections will see IK and PTI win. With an honest leader after decades, the country can only progress for the better. IK has also dealt with foreigners.and he knows how to correct Pakistan image abroad and bring in investment. Nawaz Sharif and many of PML-N members to include his close relatives like Dar had set up a net of people around institutions and other government departments so tight to support corrupt and dishonesty not easy to be broken. NS and his family has looted and took money overseas using dishonest means of detection. Great job for NAB and people to come forward and prosecute this all time thief. His Pakistan properties must be confiscated also. Would NS will come back? Government must sell all their properties and bring back the money to Pakistan to get rid of the humongous debts that they have brought every child of the nation under. A decisive day and victory for Pakistan. Hopefully, honesty and hardwork will prevail in Pakistan. Public feel justice was done. Any Pakistani will be sad to see an ex PM jailed for corruption but it is sad these people never thought that this day would come when corruption would catch up with it's consequences. I hope Nawaz Sharif and his daughter come back to Pakistan, begin their jail terms and negotiate a pay back of substantial amount of the illegally acquired wealth. Then PTI and the President of Pakistan pardon them the rest of the jail term. It would show the common man, corruption never pay, The judiciary must be respected and we sorted this out maturely and compassion was shown to an ex PM. Let it be good all all round. Great news tainted by the fact that Nawaz and Co are sitting in London and will probably apply for asylum in the UK. After 10 years or less they will return to Pakistan and do a deal with the in charge Government unless it is PTI. Same Judiciary let Musharraf, Dr Asim, Ayyan Ali, Asif Ali Zardari off the hook. We all know who is pulling the strings behind the scenes. History will be the ultimate judge. Nawaz Sharif is being punished because he refuses to bow down to the establishment. Well, this is good but the question is will the punishment b carried out? So my request to Pak leadership is to please carry out the punishment and don't buckle to the pressure. Also, now don't stop here catch all the culprits/criminals whether it is a politician or a Mullah etc. If someone has committed a crime or broken a law then he/she must be punished according to the law i.e. Allama Khadim Hussain, Imam Abdul Aziz and Abdul Rashid, Zardari, Altaf Hussain etc etc. Carry out the punishments and see how quickly the nation's attitude will change for the best. But, will they come back? I wish politicians learns a lesson from this and serve the country and it's people with honesty, sincerity and integrity and become successful in this world and in the life hereafter. @Pro Democracy We dont care about so called democracy rather we want a corruption less governess. Good riddance. But what about getting the stolen money back? Overall, good judgement, but I believe that the fine is too small. They are known to have accumulated nearly $2 billion in offshore accounts, through shell companies and properties in Dubai, London and elsewhere. $8 million reparation and just 10 year jail, does not fit the severity of the crime. If they had stolen only $8 million, will they get Rs,50,000 fine and one week in jail!? Simply inconsistent with the nature of the crime and har it did to Pakistani ecnonomy. Keeping in view the amount laundered by Nawaz Sharif and the suffering of millions of people and the country reaching to disaster, the sentence is mild. He should have been given 14 years or more. A new age for Pakistan beckons! Finally! Imran Khan's struggle of 20+ years has finally reached a tipping point. It brings tears to my eyes to finally be able to hold my head up with pride. We're not cattle - thank you Imran Khan for making the country realize this! Good riddance. The nation is free at last. Thank you CJP and judges of the Supreme Court, and JIT. Congratulations to pakistan. At least something good has started. Please upload the actual copy of verdict if possible. 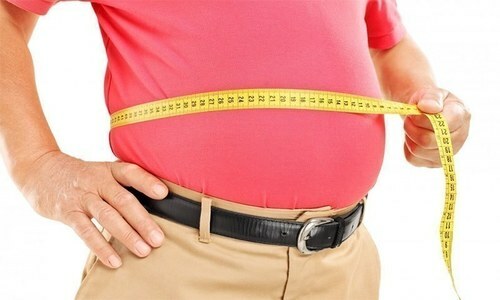 Why is fine in pounds? Shouldn't it be in rupees? @Fahad ....Democracy has been corrupted. Why do you think it wasn't working? Everyone knows what is the reason for this punishment.. Same people have propped up Imran as an alternate..
Congrats to the nation, justice has finally caught up with some of the thieves. PM Khan will inshahallah clean up the rest. Happy corruption free day for Pakistan. @Arshad ... Credit where credit is due. Excellent amount of fine: a total of 10million sterling Pound means 250billion PakRs! enough to confiscate his Pak properties and ask UK authorities to bring back stolen/looted treasure! We Need Imran Khan & Company ! @Ali ..... Two thumbs up, Ali. @Shafi Ansari .... I'll second that. Sentence and penalty is not enough. In my view, justice partially served - what about all the money Nawaz Sharif looted, who will get it back? Like vast majority of people, I also want all tax payer money back and spent on education, hospitals, new dams and other welfare projects! very small punishment, "Yes of course 2 million pounds are peanuts for, probably, Junaid Safdar's pocket money!" the whole family may remain in UK for ever. The only question was to prove legitimacy of purchasing Avenfield flats not a difficult question. I think our former PM should have answer to that. The defence lawyers through out the period were trying to criticize JIT report on technical grounds. And Shahbaz Sharif in his statement an admission of guilt by NS. The nation can rejoice as justice has been served. No politician or his family, however powerful, can loot and plunder the nation and evade accountability. This is warning to all other politicians, either deliver on your election promises or face the wrath of the people. The people of Pakistan demand true democracy. Place Zardari on ECL. Peoples money must be recovered. Thank you Honorable Supreme court and National accountability Bureau of Islamic Republic of Pakistan for bring the accountability of corrupt rulers to a great conclusion. Hope the future of Pakistan is bright looking forward and all corruption minded trying to come back into power will get a strong message of the New Pakistan and enforcement of its laws. The verdict has sent a message across the globe that no one is above the law and nothing is to be preferred before justice. Congrats to all corruption fighters! What about the other big fishes? Will they see any day behind bar? All the politicians are shady but i don't think verdict is about corruption! One and only one corrupt politician is served the verdict and convicted, all others in Pakistan are angels. "This is a very small punishment for firmly standing in front of unseen forces. The morale to fight against oppression has increased today." Madam When are you coming back..,,???? If Maryam thinks" this is such a small price to pay" then why don't both of them return to Pakistan and face the music, instead of sitting in London and making these heroic statements! Run Nawaz run. Zardari and his family should be next. Please make sure he stays there for 10 years. No exceptions!! This is very small punishment.All his property should be confiscated and funds returned to Pakistan treasury. @Citizen "The only question was to prove legitimacy of purchasing Avenfield flats not a difficult question." Not a difficult question indeed, but the answer was very hard to find. @Jagga Jasoos with greated respect that is a silly thing to claim. smoke has been created to serve a political outcome. it began in 2012. understand it. @Ahmed Mir ( AJK) "Democracy dies in Darkness" And Pakistan rises from it (darkness). @M. Siddique yes the perfect election, it was always envisioned that imran khan would have no opposition at this 2018 election. @Ahmed Mir ( AJK) "Now I know who runs the country" And we also know who will not!!! @Ali how do you know justice has been served? were you present at the trial? @lkhan not about corruption its about building a road for imran khan. If they are proven for corruption against Pakistan, then all there assets in Pakistan and overseas should be confiscated and looted money should be deposited in treasury. @Shy Guy We «all» do not know who is pulling the strings. Please tell us your conspiracy theories. This is the ending of a crook. Salute to Imran, who made the unthinkable possible. Finally....it took a long long time but atleast the justice has been served now. Kudos to IK for going all the way to make this happen. Best news in the last 20 years for Pakistan! @ExMohajirinUK. No reason for a civil war friend. You need to respect you courts who punish corrupt leaders. The country will be better served with honest people. Asif Zardari should be in Jail as his roomate. Well deserved sentences given .The Nation waited patiently for this justify decisions .Hope Pakistan would move forward into a stable & prosperous country .End of corruptions hopefully . Why selective accountability ? Why Zaradari and Imran are out ? They also the corrupt politicians and Pakistan would be a better place if these two mafias are gone too ! It will be great to see when UK courts will throw out of the window the request of PK government to give possession and ownership of Avenfield properties. "Hanooz Delhi door ast" The party has just begun. Nawaz Sharif is going to surprise the nation. If someone think. he is going to jail. is a day dreaming. Soon the care taker PM is going to send the pardon summary to President. Mamnoon Hussain. It is pay back time. He has to sign. Remember Care taker PM is the same person who knew he is retiring soon. Even then he formed a bench as head himself hearing the case. After 6 months he simply break the bench and left the case for another CJP. The Sharifs may be guilty of hiding wealth they did not pay taxes on, but prosecution has been over zealous and NAB as well as the Supreme Court of Pakistan would fail all international tests of impartiality. ".. The star witness for the prosecution was Wajid Zia Director General of NAB.." ??? Excuse me, since when is the prosecutor a witness anywhere in the world? ( only in banana republics). The Sharifs have been industrialists since the 80's, obviously they made a lot of money. Does anyone care to find out where Imran Khan got all HIS money? They didn't pay much when he played.He just filed his tax returns. He paid about $2500. ????? and can afford his Bani Gala estate. A nation of 200 million, but only 800,000 pay taxes. Where are the trigger happy judges with their Suo moto gun. And above all, until the army is brought to justice for high treason in absconding the constitution, refusing an audit of the money they get, there is no justice in Pakistan whatsoever. The man Mr. Zardari who robbed the country of billions of dollars and was called Mr. 10%. There are no outstanding cases in the courts against him and was exenorated by Pakistani courts. This is not justice and he is contesting the elections with out any issues..Justice across the board including arny generals, judges and, politicians is the right thing . Why Zardai is acquited but NS is charged is beyond me. Shameful verdict! Most people have some assets but less income , how can you punish someone for that? Everybody should be locked up then , every single politician who has inherited any land, property, houses etc . The court could in fact prove nothing at all and has only sentenced NS and family as per pre-planned scheme , under instructions from certain quarters. Pakistan's democracy has suffered a major setback today. In my opinion the sentence is light. He and all his ilk should be fined more and also the prison sentence should be longer. They have destroyed the country completely. @Awais can a poor man ask for a break? Just one culprit family in the whole country? The rest are of course holy and pious men and women. Untouchables all without saying. A landmark decision in the history of Pakistan. It will serve as a deterrence for the people who play politics with the aim to accumulate wealth, prestige and power by applying illegal and corrupt practices. @BharaRAT And what is the basis of your belief, may I ask? This is a historic day in Pakistan. It seems the society and our institutions are evolving under the democratic system (which itself needs lots of reforms, including abandonment of dynastic politics). Kudos to IK for initiating this process which would not have been possible under a dictatorship. My question is: why NS (and his cronies) are not asked to return the money they have robed the nation of? They should go to jail from breaching the public's trust and also asked to sell their property and reimburse the nation. Only 4 million pounds!. It should have been 4 billion pounds at least .. In the real world, when verdict is announced, and the person is found guilty and sentenced to 10 years in prison, they go directly to jail, Nawaz Sharif is taking his time in London while the verdict has already been read. @SHAHID SATTAR "Just one culprit family in the whole country? The rest are of course holy and pious men and women." Apparently yes, because he did not prosecute any, except his political rivals and personal enemies. @Rizwan Hamid, USA "The Sharifs have been industrialists since the 80's, obviously they made a lot of money." This is what was asked, he never proved that he had made a lot of money.